“Don’t follow to unfollow,” said the last line in the Instagram profile. What did that mean? It seemed to be saying, “To unfollow me, simply don’t follow me!” But that interpretation didn’t make sense! Morphologically and semantically, the prefix un- doesn’t work that way. When you attach it to a verb, it refers to reversing an action. So unfollowing someone wouldn’t mean simply not following them; it requires that you follow them first. In fact, even that verb meaning makes sense only with the reversible social-media sense of follow: In Instagram, Twitter, or whatever app you’re using, follow means “click a button once to add someone’s updates to your news feed”; unfollow means to click again to remove them. In real life, though, following isn’t a reversible action. The closest you can come is to stop following someone. The reverse of following would be … what? Following their footsteps backward to find out where they started? In any case, you can’t unfollow someone on social media without first following them. But wait, you say: Untied shoes can be shoes that were never tied! The unopened can of chocolate-covered peanut brittle like the one my wife gave me tonight had never been opened. (It’s open now.) This is true, and it’s because of the other way that un- can be used: It can prefix an adjective to form the negation of that adjective. So untied is not the verb untie with the suffix -ed turning it into an adjectival past participle; it’s the adjectival past participle tied, with the prefix un- giving it the meaning “not having been tied”. As for the verb untie, you don’t untie something by leaving it alone. It has to be in a knot already, and you remove the knot. For more on all this, read Ben Zimmer’s 2009 Boston Globe column. “Don’t follow to unfollow”–was it a Zen thing? Kind of like “The only way to win is not to play”? I decided to ask Doug and Adam, who are more familiar with the latest trends in this area. Some people, Doug explained, advertise that they will follow anyone who follows them; “follow back,” in the parlance. Right, I said. Some other people, Doug went on, will follow those people, and then when those other people follow these followers back, the original followers will turn around and unfollow the people they just followed. To get their follower-to-following ratio up! So when people say “Don’t follow to unfollow,” what they mean is, don’t pull this kind of funny business. Suddenly, it clicked into place for me. It was an attachment ambiguity. 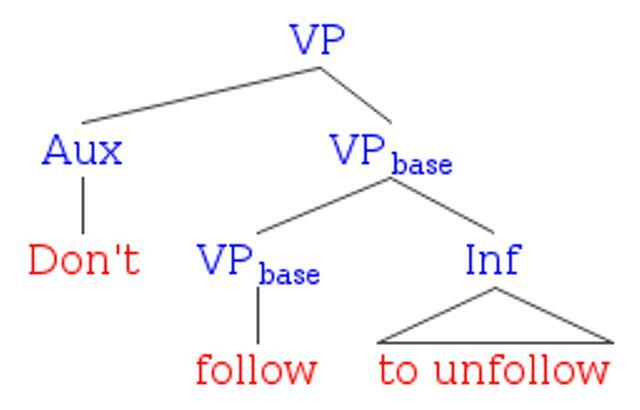 I had been interpreting to unfollow as a purpose infinitive modifying the imperative Don’t follow, as in the diagram on the left. 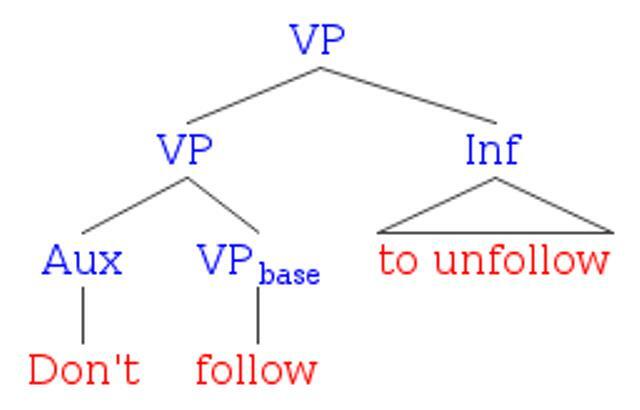 In actuality, to unfollow was modifying just the verb follow, as in the diagram on the right. But all this really brought home a kind of sad side of social media that I hadn’t been aware of. First of all, that there are people who care so much about their following size, and believe that so many others share the sentiment, that they promise to follow everyone back. They don’t care how dull or stupid anyone’s stream of content is; they just want that person to follow them. Second, that some of these people try to break the rules of this pitiful game by buying a follower and then stopping payment. Third, that players of this game are so invested in their bogus follower numbers that they send out pre-emptive threats: “Don’t follow to unfollow; I have the app.” The app, I’m assuming, is Who Unfollowed Me? or something like it, as the guy in the video describes. These apps typically advertise how easy it is to unfollow those that unfollow you, as if that’s just naturally the next step to take when you find out that someone unfollowed you. What next? Apps that find out who unfollowed you, and then force them to refollow you? Now that I understand Don’t follow to unfollow better, I guess my original interpretation could work after all. The users who don’t want me following and then unfollowing really would prefer that I did my unfollowing by never following in the first place: To unfollow, don’t follow. 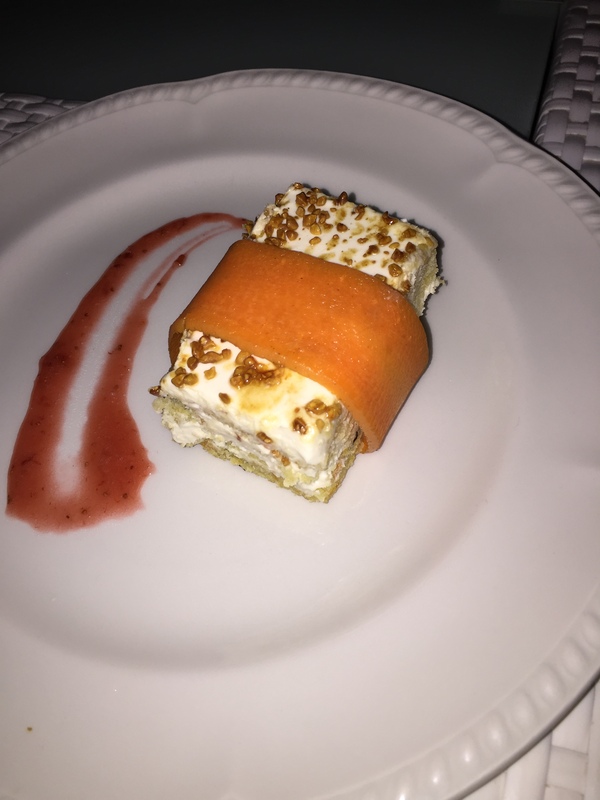 In a first for this blog, we have a guest post, written by Elena Lathrop. Elena is a recent UCLA graduate with a B.A. in Sociology and a Linguistics minor, and a freelance writer. (In addition to having a freelance writer, she also is a freelance writer.) You can follow her on Twitter at @ElenaLathrop. I pay a lot of attention to language and the way people speak. It’s just what linguists do. We can’t even help it. My friends often ask me to analyze their speech and point out anything unusual or interesting about the way they pronounce certain words or their word choice. For example, I have a few friends who say /ɪɾ ̃ əɹɛstIŋ/ (in-ter-es-ting) instead of /ɪntɹəstIŋ/ (in-tres-ting). Recently, I’ve been noticing a phenomenon involving the words “love” and “hate”. They’ve undergone hyperbole, just like the word kill. As a woman, I can tell any of my female friends that I love them, and they won’t question my sexuality. I can even say it to my close guy friends, and they won’t question my motives or my true feelings towards them (well, as long as it’s already been established that it’s a completely platonic relationship). In these contexts, love simply means that you’re very fond of the person you’re saying it to and you value your friendship with him or her. Think of love being said in a different context – the early stages of a relationship. Of course, if you say “I love you” to the person you’re dating in this circumstance, it will most likely not be interpreted with the “very fond of you/value our friendship” meaning. It takes on the stronger, more serious connotation of romantic love. Again, what’s important here is context, just like with kill. If you said “I’m going to kill you” to someone you’re pointing a loaded gun at, they’re likely to think you are actually about to take their life. However, if you said that same sentence after a friend pulled a funny prank on you, it would not be interpreted in that sense. Just like how real estate is all about location, location, location, semantics in linguistics is context, context, context. B (comment on the status update, from someone who isn’t finished with finals): I hate you. In this type of context, hate means something more like “be jealous of” or “wish I were in someone’s position right now”. I’ve found, at least in my experience, that it can also mean you’re slightly angry or disappointed in a friend. For example, say a friend starts telling you about her incredibly awesome drunken night out, and you weren’t invited. You may something like “I hate you. You should have texted me!” Do you really mean that you now hate your friend due to such a trivial event? No. You’re just a little upset that they didn’t bring you along, but your friendship is still intact. So there you have, in a nutshell, the evolution of the words love and hate, and the new meanings they have taken on. You may be asking yourself if this is a bad thing. I’ve heard plenty of people complain about this, saying that the word love has been devalued and reduced to some lesser form. Similarly, many people complain that hatevis a strong word and should not be used so freely. Frankly, linguists couldn’t care less about these types of complaints. Our job is to sit back and watch language evolve without making judgments on what it has become and if it’s a good or bad thing. It’s natural and inevitable for words to change meaning in this way, which is why I personally don’t criticize the phenomenon. Words change meaning. It happens. And everyone is entitled to their opinion on it…love it or hate it.